Apples don’t keep the doctor away. Choline and lipids and L-theanine do. And if you’re already supplementing choline & lipids, particularly in the forms of alpha-GPC & phosphatidylserine, then not only will you avoid doctor visits but you’ll also have no need for Doctor’s Best Natural Brain Enhancers. Because all Doctor’s Best has is alpha-GPC & phosphatidylserine. Which aren’t the rarest ingredients in the 2017 nootropic supplement market, so I’m wondering: why even consider this supplement at all? Read the review to find out. Who Takes Doctor’s Best Natural Brain Enhancers? Conclusion: Does Doctor’s Best Natural Brain Enhancers Work? 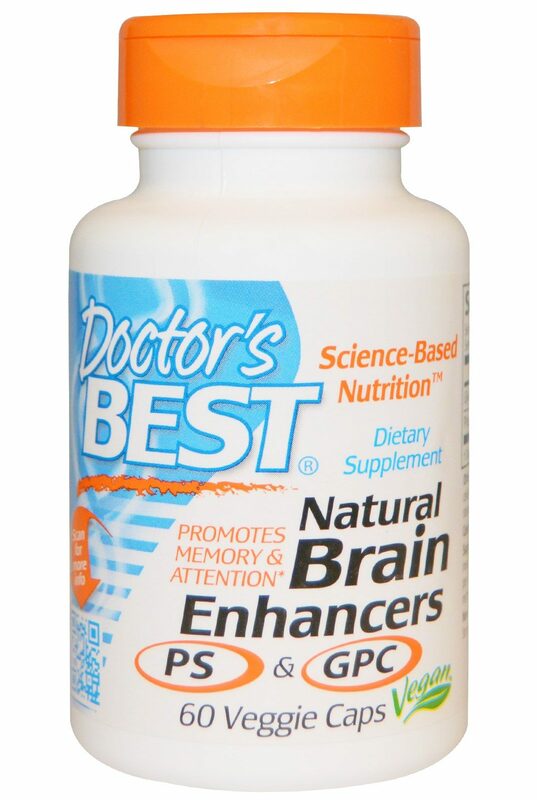 Doctor’s Best Natural Brain Enhancers supplies two smart natural brain enhancers: Alpha GPC & Phosphatidylserine (PS). Alpha GPC: natural source of nootropic choline, as opposed to the ineffective, non-nootropic choline bitartrate. Phosphatidylserine: great for elderly health & cognition and a smart dietary supplement for all ages. Is that it? Yes, that’s it, but what more do you expect from a product that’s priced as low as this? Other Ingredients: Dicalcium phosphate, modified cellulose (vegetarian capsule), silicon dioxide, magnesium stearate (vegetable source), magnesium silicate. Contains soy. Directions: Take 2 capsules daily between meals, not later than 4 pm. Intakes up to 6 capsules per day may be beneficial, or higher intakes as recommended by a nutritionally informed physician. GlyceroPhosphoCholine (GPC) – Or alpha GPC, the densest source of nootropic choline, the precursor compound to acetylcholine & phosphatidylcholine, improving memory & focus. More on Alpha GPC. PhosphatidylSerine (PS) – The “Other Ingredients” state this supplement contains soy, so I’m assuming this PS is soy-derived (as opposed to the sunflower-derived stuff). Either way, a smart nootropic ingredient here, elevating brain health by optimizing brain toxin removal & cell-to-cell communication. More on PS. 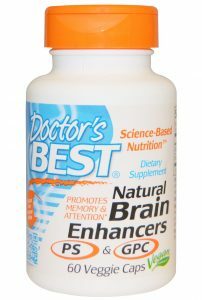 Doctor’s Best does everything it claims to do: it supplies natural brain enhancers that truly enhance the brain, namely in the promotion of memory & attention, as indicated on the supplement’s bottle. Yet, it supplies only two natural brain enhancers, thus limiting the nootropic power of its brain enhancement potential. Suffice it to say: Doctor’s Best Natural Brain Enhancers is a good yet weak supp. On its own, I can’t imagine this nootropic supplement getting you very far. Perhaps taken with racetams, Doctor’s Best’s alpha-GPC may hit that cholinergic synergy sweet spot — however, this requires the outside supplementation of racetams for Doctor’s Best to hold any value there. Having said that, Doctor’s Best still makes for a decent, cheap option of including GPC & PS into your daily nootropic stack (although, you may need to double down on the recommended daily servings to improve the cognitive benefits). Doctor’s Best may not be the largest formula but it technically earns a two-for-two 100% nootropic set-up with its smart selection of GPC & PS. This supplement can easily & (more importantly) safely be stacked with other nootropic supplements. Most online & in-store retailers sell this supplement cheap, often times far below its manufacturer suggested price. The fact that you’ll need to supplement this supplement with other supplements doesn’t speak highly of this supplement’s standalone power. The bottle boasts of its Veggie Caps, however its veggie material is crap — you mean to tell me you can only fit 400 mg worth of supps in two capsules?? The general quality of this supplement isn’t great. It’s not bad, however I’m holding these guys to a higher standard here given they only have two ingredients to manage. Although, you’d be hard pressed to find Doctor’s Best Natural Brain Enhancers at this listed price, as most retailers offer the product at or less than half this price — e.g., Walmart sells at $13.99 and AllStarHealth at $11.69. Doctor’s Best states that “Numerous double-blind trials catalog the benefits of GPC and PS for people of all ages” — which to me indicates that these manufacturers intend to broaden their target audience to everyone. And while everyone may benefit from this supplement, the older customers will likely benefit more by Doctor’s Best’s PS. On the whole, the customer reviews are positive but written in unhelpfully vague terms. You can buy Doctor’s Best Natural Brain Enhancers through a number of various retailers, including iHerb, Walmart, AllStarHealth, and, yes, Amazon. Doctor’s Best Natural Brain Enhancers may work but will probably require outside supplementation for you to get the most out of this supplement. Or rather this supplement may further promote the cause of another by granting additional raw choline material. Yet, even as a choline supplement, Doctor’s Best isn’t the best. Alpha GPC may be a good nootropic choline source (in fact, it holds the highest concentration of choline able to cross the blood-brain barrier), but I find citicoline as a far superior nootropic option for its dual supply of choline & cytidine, a precursor compound to the nootropic uridine. If you’re looking for a big-time nootropic brain enhancer, I recommend looking elsewhere (look here!). However, if a cheap supply of GPC & PS is all you need, then Doctor’s Best is a solid choice.